Cookbook club is easily the highlight of my month every month (sorry Kev). It’s an excuse to bring old and new friends together. It’s also a reason to celebrate various different cooks that I admire - over the past few months we’ve celebrated: Ina Garten (QUEEN), Deb Perelman, & Gaby Dalkin - to name a few. Before I get into this month’s featured chef / author I think I should share with you how I run each month’s cookbook club? I try to keep it consistent as best I can, we almost always do the first Thursday of each month. Cookbook club should technically be called cook blog club - because I try to chose a chef who has lots of recipes readily available online. 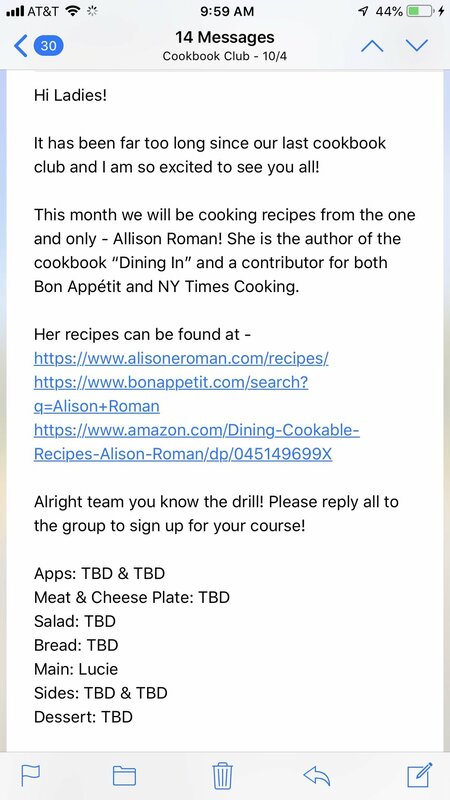 I send an email out following each cookbook club announcing the date of the next one, I give each attendee 1-2 weeks to say if they can attend. Afterwards once I have the group set, I send an email out asking people to sign up for dishes. Instead of everyone bringing a mish-mash of wines I take it upon myself to get a case of red / rose (red for winter, rose for summer) and 6 bottles of white wine for each Cookbook Club. The next morning when our wine hangovers are thickest I venmo charge everyone $15-20 to settle up. Seat the table! One of the best parts of cookbook club is bringing people together - I like to seat the table to help new people feel integrated into the group. One of the things I love most about cookbook club is that it helps make cooking (and entertaining) accessible for some of my friends who may find it intimidating. I do try to pic a chef that is Keep the wine (and water) flowing and everything will be fine! This month we celebrated Alison Roman - total boss babe and writer of the Dining In cookbook as well as contributor to Bon Appetit and New York Times. I’ve been a long time follower of Alison’s and I was beyond excited to feature her this month! Last night I made Alison Roman’s Weeknight Porchetta - and let me tell you it was easy and DELICIOUS. I served it with a horseradish applesauce cause YOLO. Weeknight Porchetta, served with roasted potatoes and garlic. Preheat your oven to 425. Peel and finely chop 4 garlic cloves. Strip the leaves off 1 rosemary sprig, discard the stem and finely chop the leaves. Finely chop 1 tbsp fennel seeds. Mix the copped garlic, rosemary, fennel seeds, salt, and 1 tbs of olive oil in a small bowl season with salt and pepper. Rub Garlic mixture all over the pork tenderloin on a rimmed baking sheet. This can be done ahead of time - chill until ready to bake. Scatter the remaining rosemary sprigs in a large baking dish - set pork tenderloin on top. Cut bacon slices in half, wrap each half slice around the pork tenderloin. This is a deviation from the recipe - I have found that if you half the bacon it is easier to maneuver over the pork and you don’t end up with any flabby bits. Roast for 30-40 minutes, or until a meat thermometer reads 145 degrees. Transfer to a cutting board and let rest for at least 10 minutes before slicing.